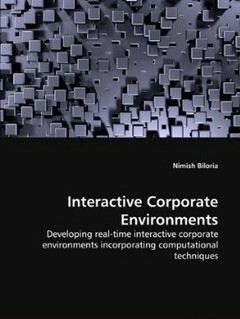 The inter-disciplinary research book exemplifies upon a four year long research experiment to develop real-time interactive corporate office environments which addresses the behavioral patterns and preferences of its occupants with a strong underpinning in the domain of computation, interaction design and open system typologies. Rather than creating conventional inert structural shells (hard components), the development of a meta-system, or in other words creating a 'soft' computationally enriched open systemic framework (informational) which interfaces with the 'hard', material component and the users of the architectural construct formulates the core agenda of the research work. This soft space/meta system serves as a platform for providing the users with a democratic framework, within which they can manifest their own activity oriented programmatic, spatial and ambient alterations in order to create self designed and customized spatial alternatives. The otherwise static/inert hard architectural counterpart, enhanced with contemporary technology thus becomes a physical interface prone to real-time spatial/structural and ambient augmentation to optimally serve its users.